We are so thrilled to be part of the 2015 Review Crew. Our first review is for SchoolhouseTeachers.com (http://www.SchoolhouseTeachers.com) Yearly Membership! SchoolhouseTeachers.com is an online resource that includes downloadable and printable items in addition to online classes. It provides full year, semester long, and supplementary content in a wide array of core and non-core subjects for students age Pre-K through high school. Teacher and parent resources that are invaluable in running a homeschool household are also included. There truly is something for everyone! After receiving our login code, it was quite simple to get started. While we each have our own computers, Amber (7th grade) and I usually prefer to use our iPads for school related work. However to ensure all went smoothly for the first login on this site I did use my computer. The navigation menu for SchoolhouseTeachers.com is located at the top of every page and is straightforward, uncluttered, and easy to access. All of the features of the site are clearly labeled and found through the menu. This made it so simple to find the areas that most interested us and to begin using the site. After perusing the site together, Amber and I found several resources we wanted to try immediately and a few for next semester too. We did agree to also try using the site on our iPads since we are not fond of being tied to the computers. I'm happy to report that the site works beautifully on the iPads with no discernible difference from the computer and almost the entirety of our experience with SchoolhouseTeachers.com is via iPads. Literature discussion time. 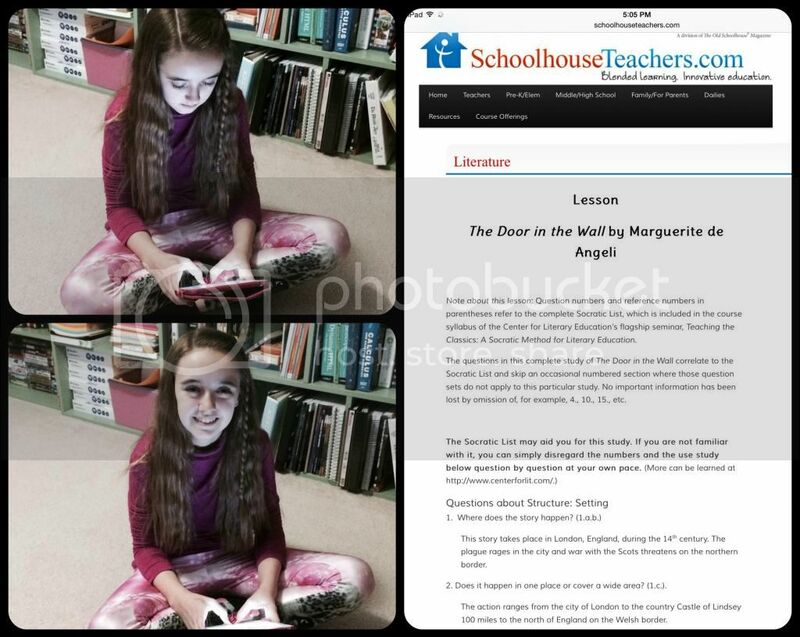 Amber used her ebook version of The Door in the Wall while I used SchoolhouseTeachers.com on my iPad to lead our discussion. Our first selection was from the Middle / High School Literature section. Just last month Amber finished reading The Door in the Wall by Marguerite de Angeli as part of our medieval history study. Unfortunately, we did not have a resource to facilitate our study of the book and had pretty much left it with a cursory plot discussion. On SchoolhouseTeachers.com we found a complete study of The Door in the Wall that even included questions which correlate to the Socratic List. Amber and I enjoyed using the literature study of The Door in the Wall to frame our discussion of the main themes and character development. We were especially impressed with the study's questions over the literary devices used in the book. The study is thorough, but does not get hung up on plot details. Only the details that pertain to the progression of character development and understanding of the theme were used in the study. We were so impressed with this literature study and definitely plan to return to this resource for our future literature guides. The Dailies section of SchoolhouseTeachers.com includes daily exercises, puzzles, and even quizzes over a variety of topics including grammar lessons for first through seventh grades. We do have a grammar program that we like and with which Amber has had success. Still, the daily grammar lessons caught our attention as Amber LOVES language and would happily work on grammar all day. The grammar lessons for the combined grade levels of sixth and seventh grade contain 16 weeks of daily lessons that are patterned so that every week runs the same way. Mondays deal with nouns, pronouns, etc, while Thursdays work on capitalization and punctuation, and Fridays include sentence diagramming. Although Amber used the lessons as a supplement to her current curriculum, they are definitely robust enough to be used as a stand alone grammar curriculum. 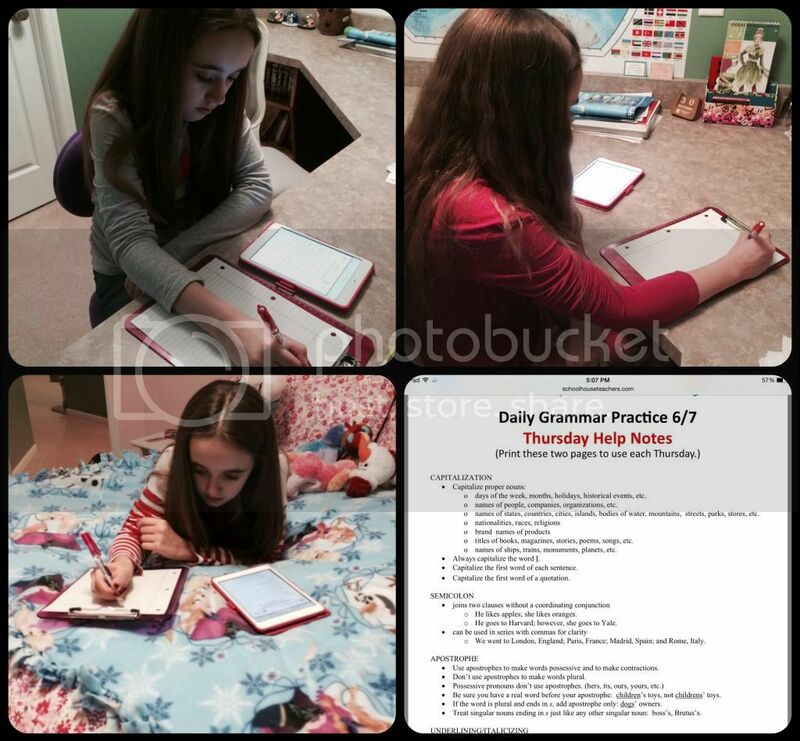 Amber accessed the daily grammar lessons via her iPad after completing her regular grammar assignments. She found them to be a nice way to review grammar each week regardless of the current topic in her other curriculum. 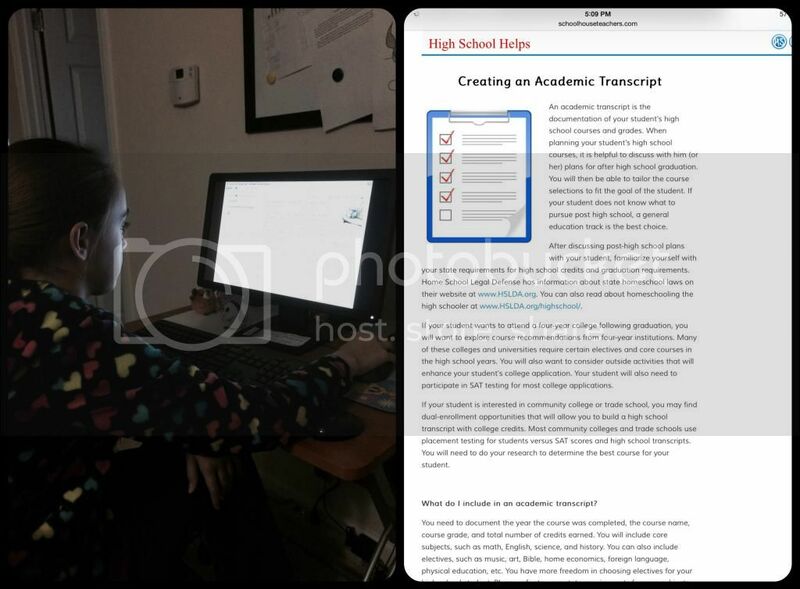 Personally, I was intrigued by the Creating an Academic Transcript section in High School Helps. Amber may still only be in seventh grade, but she is already taking a few high school level subjects and I need to ensure they are documented correctly. The SchoolhouseTeachers.com transcript section includes details on giving credits, final grades, and cumulative grades. There are also downloadable sample transcripts and a video on transcripts. Here, in one place, I've found all the resources I need to document Amber's high school credits. What a relief. We found SchoolhouseTeachers.com to have a wealth of information and resources for homeschooling families. Whether you are looking for a full curriculum or supplemental resources this site definitely has it all and has become our go-to location for new curriculum. Membership to SchoolhouseTeachers.com is only $12.95 a month, or you can save over 10% on a one-year membership at just $139. This is all inclusive and only one membership is needed for your entire family! And as a bonus, SchoolhouseTeachers.com is having a huge sale right now and through Christmas Day at 11:59pm ET. 40% off the monthly membership ($7.77/month) or 50% off the Yearly Membership ($64.26/year). Homeschool families who join at this rate will keep it forever as long as they maintain a continuous membership. Be sure to check out more reviews of SchoolhouseTeachers.com to see how other members of the Review Crew used this great resource. There really are a wealth of resources! The Dailies Section is one of our favorites!